Whiskey Glasses with Pewter Celtic Symbols 4 Set by Robert Emmet Co. at Marion Street Deli & Pub. MPN: 1830/50. Hurry! Limited time offer. Offer valid only while supplies last. Outside of Guinness, whiskey is one of an Irish person's favorite things! These Celtic glasses will allow you to drink your whiskey the Irish way! Outside of Guinness, whiskey is one of an Irish person's favorite things! These Celtic glasses will allow you to drink your whiskey the Irish way! Each glass holds approximately 10 fluid ounces, making it a good size to hold whiskey on ice. 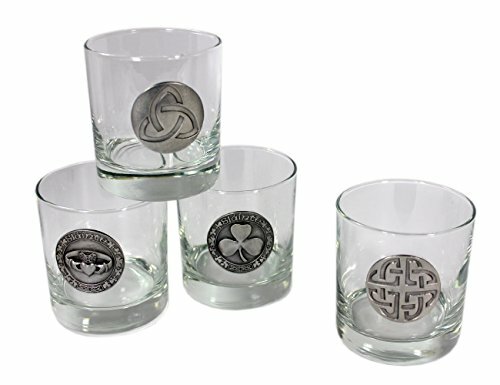 These Celtic glasses each come with a unique design, made with a pewter pressed design in the middle. The set features a claddagh, a trinity knot, Celtic weave, and the lucky shamrock! Each of these symbols has significance in Irish culture, and will certainly bring the Irish spirit to your spirits! These Celtic whiskey glasses are provided by the Robert Emmett Company, who makes Celtic-inspired goods with American-made materials! These whiskey glasses will remark on not only your good choice in beverage, but also your great choice in glassware! This Celtic glass set features four unique whiskey glasses. Each glass holds approximately 10 fluid ounces. Each glass features different Celtic symbol. Made by the Robert Emmet Company. If you have any questions about this product by Robert Emmet Co., contact us by completing and submitting the form below. If you are looking for a specif part number, please include it with your message.